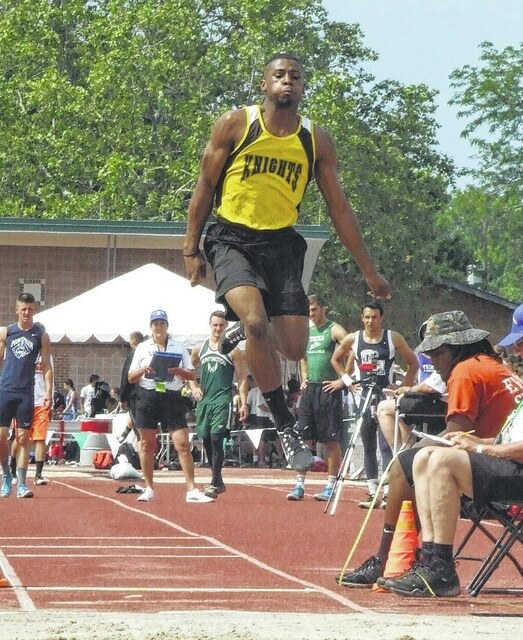 Rob Hamilton | Morrow County Sentinel Northmor’s Demetrius Johnson stands at the top of the podium, flanked by other competitors in the Division III long jump, on Friday after winning that event with an effort of 22’4.25”. Rob Hamilton | Morrow County Sentinel On his final preliminary jump in the state meet, Northmor freshman Demetrius Johnson leapt 22’4.25” — an effort good enough to earn him a state championship. Entering the last of his first three jumps in the Division III state track meet’s long jump competition Friday afternoon, Northmor freshman Demetrius Johnson needed a good one just to qualify for the finals. Johnson went for 19’4.5” on his first attempt and fouled on his second to be in last place among the eight competitors in the first flight, putting him in jeopardy of being eliminated. However, not only did his third jump place him in the finals, the effort of 22’4.25” was good enough to put him in first place, where he remained the rest of the way in winning the state championship in the event. While Dylan Snyder of Montpelier was able to jump 22’4” in the finals, neither he nor any of the other competitors were able to match or exceed Johnson’s big jump. Making Johnson’s win as a freshman in an event dominated by upperclassmen (all other placewinners were either seniors or juniors) was that he wasn’t even planning to run track this year initially. Until the spring of 2014, Johnson was a student in the Columbus South school district, but moved to Morrow County on the wishes of his mother after getting into problems with curfew in the city. He initially lived with his grandmother and now is with Ben Pletcher, the junior varsity basketball coach for the Knights who is serving as his legal guardian. He noted that support helped him in track. Early in the year, he wasn’t regularly winning the long jump in meets and was jumping in the low 19-foot range. However, he took first place in the Blue Division during the Mid-Ohio Athletic Conference meet with an effort of 22’2.5” and then won at both districts and regionals before keeping his hot streak alive in the state meet. “I think I have a lot of of people helping me and telling me I’m doing good, which helps,” he said. While with Northmor, Johnson has kept active in sports. He started at tailback for the JV football team and also lettered as a varsity player before starting at point guard for the varsity basketball team. After winning a state championship in track — the boys’ team’s first since Ian Connor took the 3200 in 1997 — he has made a good name for himself at his new school. However, there is still one thing he needs to get used to in his new setting amongst farm animals. “I’m a city boy and I still have to get used to that smell a little bit,” he joked.